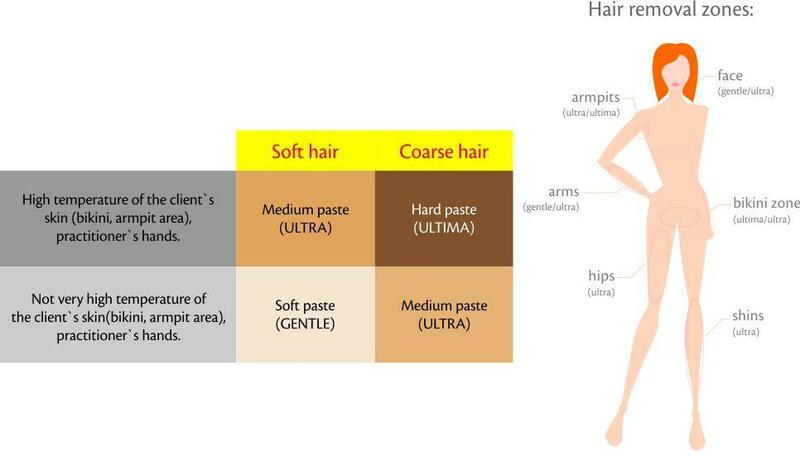 The most important thing is to choose the right type of paste for sugaring. Professional manufacturers usually offer three types of sugar paste: soft, medium and firm. This allows a practitioner to work with any type of hair. The hardness of the sugar paste should be chosen according to the hair type: the coarser the hair (usually dark hair), the harder should be the paste. The choice also depends on the temperature: of the practitioner’s hands ( the warmer the hands, the harder should be the paste); of the area being treated ( bikini area and armpits are usually warmer than the rest of your skin); and of the overall room temperature where the procedure is taking place. If you are not sure what type of the paste to buy, we recommend buying all three types to try them and to figure out what type of the paste you need for different conditions and skin areas. Keep in mind that if you don’t have a vast experience in sugaring, the consumption of the paste might be a little higher than the experienced practitioners have. * If the sugar paste doesn’t stick to the skin well enough, you might have chosen the wrong type of the paste (too hard), haven’t warmed it enough or haven’t “stretched” it as a preparation for the procedure. Keep in mind that the paste should be prepared for work by stretching movements! When the paste is ready, it acquires a light color. This refers to the hard and medium paste while the soft one doesn’t require any warming and usually ready to use right away. * If the paste won’t unstick from your hands, it means that the paste you chose is too soft or it was warmed up too much. The harder the paste, the more time it needs for warming up. Usually, the soft sugar paste doesn’t require any preliminary preparation. The operating temperatures of the paste are between 77 and 95F. The paste is very sensitive to temperature changes, even a slight change of a couple of degrees can change its qualities. For example, if the temperature outside is very low, the surface temperature of the client’s skin (especially her/his leg one) will be lower than the overall body temperature. On the contrary, in summer, when it’s hot outside, the body temperature will be higher than usual. AND THE MOST IMPORTANT THING: Don't be afraid of the sugar paste. Don’t rush and don’t panic if the paste spreads “weirdly, not as it should”. Don’t be too careful with the paste: it’s better to scoop more than to make the procedure long and tiring. A lot depends on the technique of applying the paste and the practitioner’s skills. But it’s very easy to learn to get excellent results. Be patients and don’t give up. We’re sure you’ll succeed! Many women wonder about bikini area epilation as it’s the most painful procedure of all types of depilation. Sugaring is made for this one! It gives the minimal pain feelings and leaves the skin very smooth.